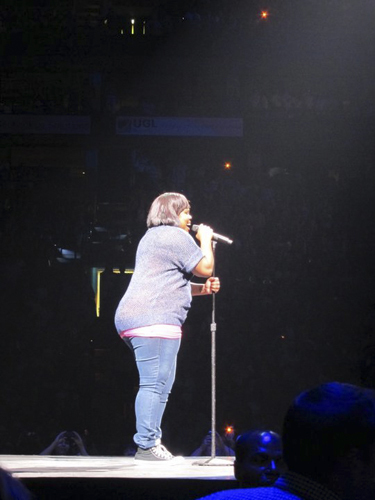 It should come as no surprise that when the second annual Glee Live! Tour was announced, I practically jumped out of my chair to circle the presale date on my calendar. I attended the tour last year at Radio City Music Hall with Please Welcome Your Judges intern Chris, and looked forward to seeing the new show in an arena setting. 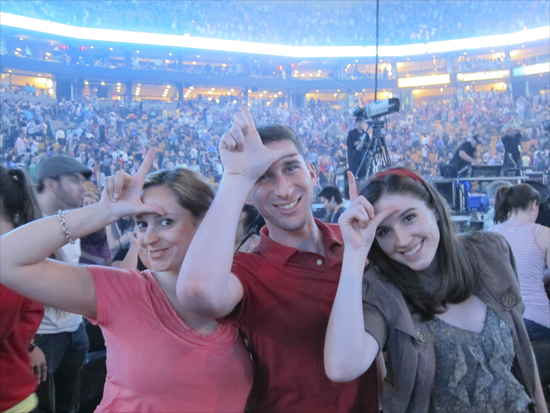 So I recruited fellow Gleeks Ali and Lilla (pictured above) and we got some killer floor seats at the TD Garden show in Boston. 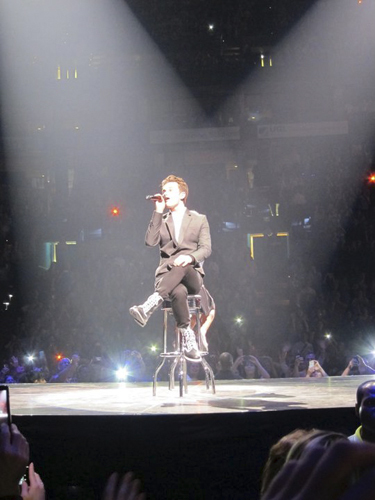 In fact, our seats happened to be next to a mini-stage in the back of the arena where several of the performances took place. The show was non-stop, action packed fun. These people know how to put on an entertaining show—lights, fireworks, video snippets of Will and Sue, vignettes with Brittany S. Pierce and, of course, all of our favorite music. With a few exceptions, this year's tour focused on Season 2 music, which was a nice reminder of all of the fantastic moments the sophomore season brought us. In fact, most of the songs were ones honored in the Season 2 Thunderclap Awards last week. And, yes, I'm just going to use character names. 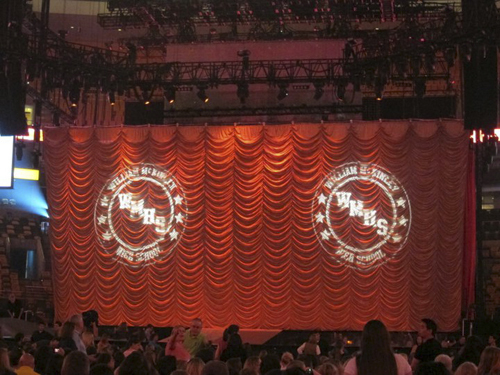 The curtain before the show, complete with William McKinley High School seal. LXD opens the show. 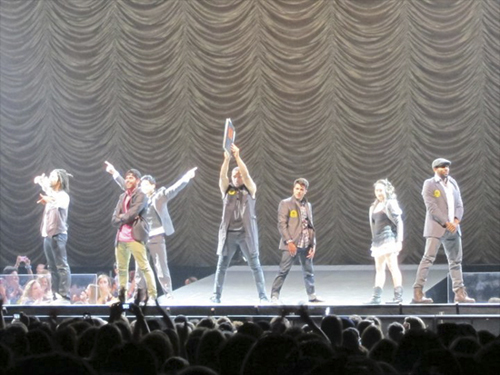 Notice SYTYCD alums Legacy (3rd from left) and Twitch (far right). 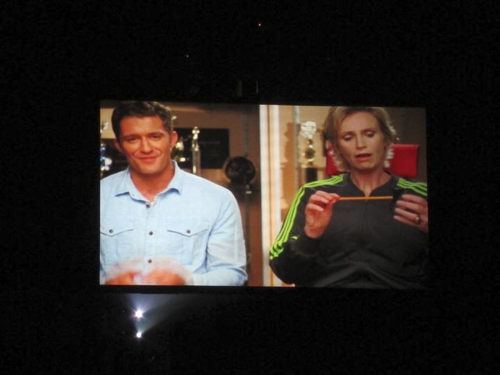 Mr. Schue and Sue welcome us to the show. Insert requisite hair joke. 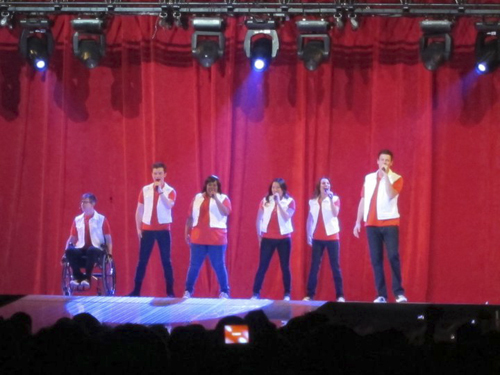 The 'original six' open with "Don't Stop Believing," later joined by the rest of the cast. 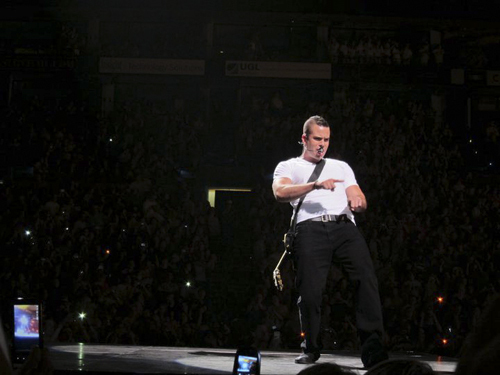 Puck starts "Fat Bottomed Girls" on the mini-stage directly next to our seats. Mercedes on the mini-stage. Diva. 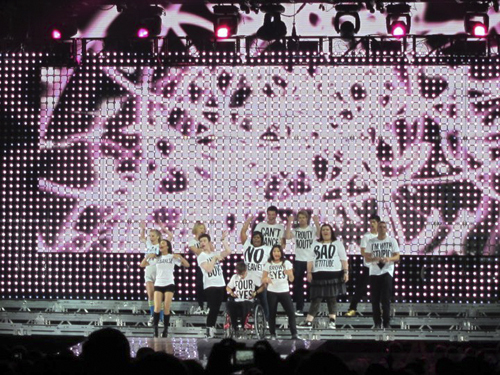 "Born This Way," complete with shirts (crew members shot t-shirts out of launchers during the song). 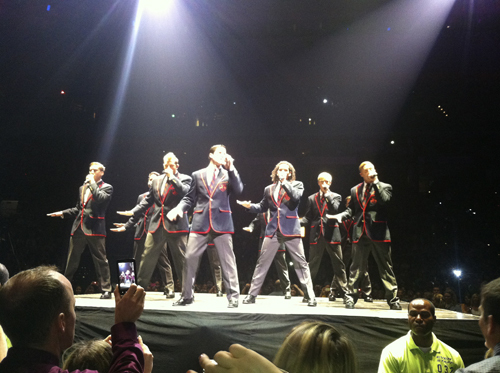 Blaine and The Warblers sing "Teenage Dream" next to us. Much swooning and screaming commences. Kurt singing "Happy Days Are Here Again / Get Happy." 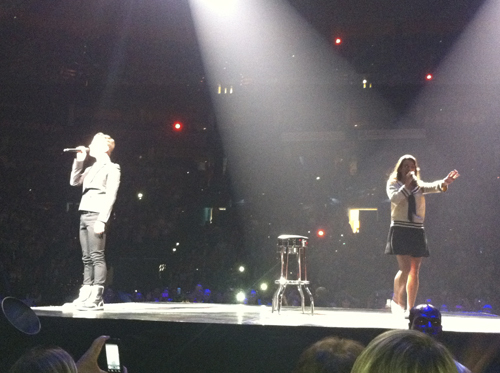 Kurt and Rachel singing this year's runner-up for Best Mash-Up (and one of my all-time favorite songs). Backup dancer (and amazing SYTYCD alum) Courtney Galiano dances on the mini-stage during "River Deep, Mountain High." 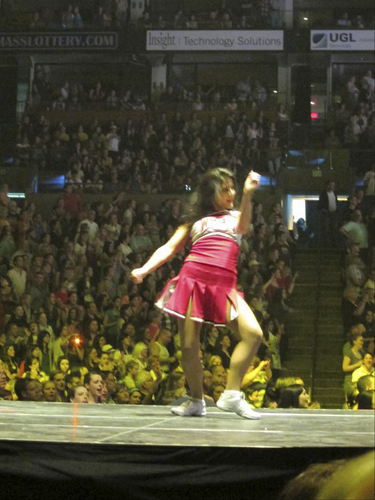 Kurt, Brittany, Tina and the backup dancers perform the "Single Ladies" dance as part of the encore. Artie busts out the "Safety Dance." The final song of the encore, "Somebody to Love." Amazing. 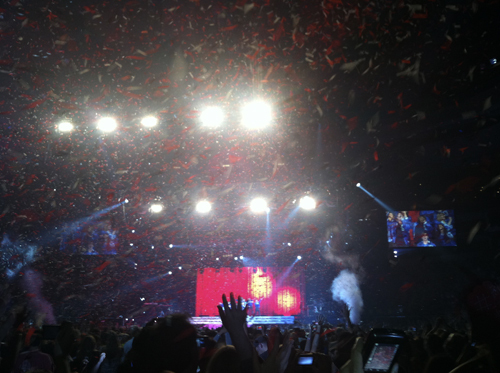 Confetti covers every inch of the TD Garden. I never want it to end. Many thanks to Ali for providing most of these pictures (though some came from my trusty iPhone camera).